New Mexico first state to adopt Navajo textbookState officials formally adopted Yazzie's book, Diné Bizaad Binahoo'ahh, or Rediscovering the Navajo Language, on Tuesday in Santa Fe. While other books on Navajo language exist, state officials say New Mexico is the first to adopt a Navajo textbook for use in the public education system. About 10 school districts in New Mexico provide Navajo language instruction. Out of seven American Indian languages that were taught in the public school system during the 2006-07 school year, 5,024 students were learning Navajo.And:School districts in New Mexico, as well as U.S. Bureau of Indian Affairs schools, can review Yazzie's book and decide whether to use it starting in the 2009-10 school year. The book will be accompanied by a compact disc with the voices of Yazzie and her brother, Berlyn Yazzie, a former educator and administrator on the Navajo Nation. 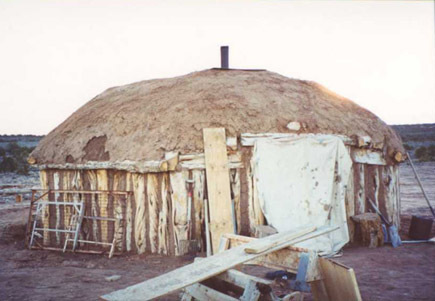 In the Navajo culture, certain topics—such as how to build a hogan or cradle board and how to care for cattle and horses—should be addressed by men. Other topics, including the preparation of food, clothing and caring for children, should be addressed by women. And:Each chapter of the book, which Yazzie said is suitable for students of all ages, begins with a cultural lesson and guides readers through verbs, sentence construction, clanship, clothing, formal education, telling time the Navajo way, the reservation, Navajo teachings, corn fields, livestock, textures, shapes and the Navajo government. It also includes pictures of people who have lived on the Navajo reservation, which stretches into New Mexico, Utah and Arizona. Yazzie said she looks forward to students sharing the book with Navajo elders and "pretty soon conversation will be sparking around fires." Elementary students participate in Dine summer language campElementary school children in Bloomfield are breaking away from their TVs this summer to learn about the history and culture of the Navajo people—in a class conducted entirely in the Navajo language. The Diné Language Immersion Program, for students in kindergarten through sixth grade, runs from July 7-30 at Central Primary School in Bloomfield. The course lasts all morning, from 8:30 until noon, Monday through Thursday. "I was just watching TV all day," said 10-year-old Zachary Augustine, referring to his summer before the class and why he decided to attend. Heritage is at the heart of the lessonsHis songs don't make the American Top 40. Instead they have a more useful purpose: To help keep children of American Indian descent connected with the language of their heritage. Taylor, a Walpole Island resident whose Ojibwa name is Kaangaadese, uses songs he writes as part of a class he teaches in American Indian language Wednesday nights at Algonac Community Center. "I like to teach every day language using native language songs," Taylor said. "It is a good teaching tool." Labrador Inuit struggle to save languageNunatsiavut, the governing body of the Labrador Inuit, will begin work on a 50-year plan to save its vanishing language, at a conference starting Tuesday in Nain. Nunatsiavut officials will look at expanding programs, such as the Language Nest founded in 2001 in Hopedale, to expose babies to the Inuktitut language.A bit on how the Language Nest works:Doris Boas and her son Cole, 2, used the small classroom in the Nunatsiavut Health Centre for the Language Nest to learn Inuktitut together from a computer program. Boas said although her family spoke the language, she never learned. "My parents were fluent and I wasn't taught," Boas said. "It's sad because in the past, it was just natural for it to be said; my parents grew up knowing just Inuktitut, and for it to come this far, to almost losing it, it's sad," Boas said. She now hopes to learn more, along with her son. Agnes Able, who teaches at the Language Nest, said she's heard a lot of first words in Inuktitut from the babies and from their parents. However, she said it's often hard for parents to keep up the language at home, once they finish the two-year program in the classroom.